Hang tag customers can now accomplish several different tasks within the same order by using St. Louis Tag's new data management technology. 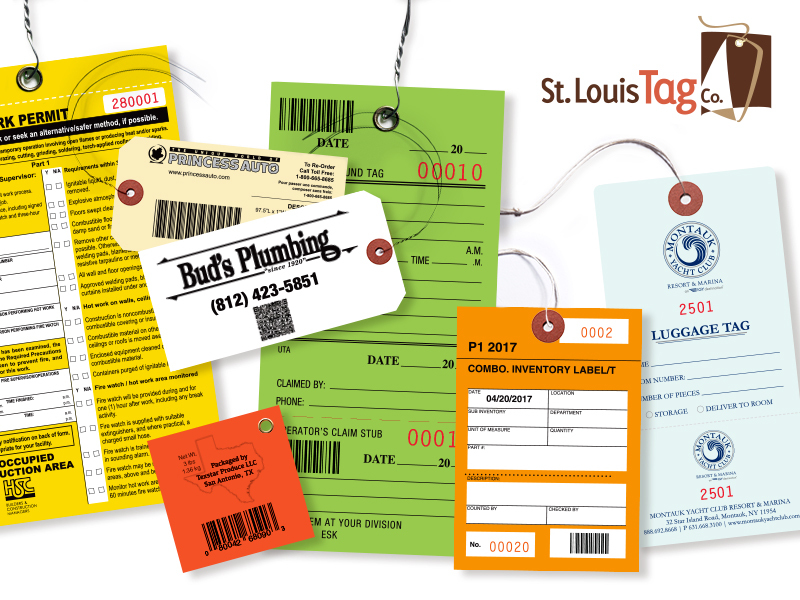 Whether you are in the retail world using hang tags to increase sales and promote your brand, or managing your inventory and assets, St. Louis Tag can add value to your hang tags and business. "St. Louis Tag now has the ability to use interchangeable text, graphics or images within a single order to give each tag unique marketing and tracking characteristics," said Bob Barenholtz, President of St. Louis Tag. "For instance, each individual tag in an order of 1,000 tags could have a unique message or function depending on the information the customer provides. We can transform a tag into a printed piece that can help manage inventory or promote a personalized marketing message. Our personalized hang tags are used for asset control, inventory, logistics, warehousing applications and more. The retail hang tag could direct the perfect marketing message to the right audience." "Customers are seeking tags incorporating variable data (VDP) technology to help them use their own data to manage their businesses more efficiently," said Barenholtz. "Capturing information from a customer's spreadsheet or database, St. Louis Tag incorporates the data to print consecutive numbers, barcodes, QR Codes, personalized graphics, text or variable marketing messages. Common examples of custom hang tag applications using VDP are retail product tags that have unique marketing characteristics but use the same branding logo, travel and luggage tags, inventory tags, asset management tags and industrial tags of all kinds." "At St. Louis Tag, we understand the importance of promoting consumer products, managing assets and keeping track of inventory. That is why we are continually listening to our customers' feedback to help them sell more goods and services, track assets, and improve the tag user's overall experience," said Barenholtz. About St. Louis Tag Co., Inc.
St. Louis Tag Co., founded in 1959 in St. Louis, Missouri, specializes in manufacturing and finishing custom printed tags such as hang tags, shipping tags, industrial tags and retail tags. The company offers a wide range of custom options, including various tag stock such as Tyvek®, synthetic and paper, multiple choices for wire and string attachments and eco-friendly materials. St. Louis Tag's capabilities and the quality of its products have helped the company set the industry standard in manufacturing customized tags at competitive prices. For more information please visit www.stlouistag.com.